ASICS is a fantastic Japanese company and has been in business since 1949. The company’s name ASICS is an acronym that stands for anima sana in corpore sano which in Latin means “a sound mind in a sound body.” With their top notch products, I have to admit that ASICS has taken their motto straight to the heart. Throughout these years, ASICS has produced excellent running shoes for all types of feet, professional footwear, and sports equipment for a wide range of sports. 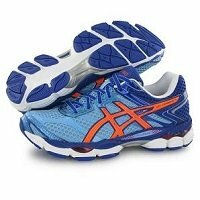 In their extra ordinary line of products is a pair of ASICS GEL-Cumulus 16 running shoes, which is a great choice for runners with high arches. These shoes are made to satisfy the needs of supinators or under pronators. The GEL-Cumulus 16 by ASICS is a running shoe built for an under pronator who needs cushioning, flexibility, and improvement in the natural stride of his feet. The shoes are comfortable to wear and enhance a runner’s natural stride elegantly. They are equipped with Impact Guidance System (I.G.S) which works to improve the natural gait of a runner’s feet. The outstanding feature of the GEL-Cumulus 16 is the flexibility of the sole. This is an important feature to have in any running shoe for high arches, because you do not want any reduction in positive pronation. The GEL-Cumulus 16 running shoes by ASICS come with a number of features. Here is a brief rundown of the products feature set, see the full list here. Apart from a host of features as mentioned above, the ASICS GEL-Cumulus 16 running shoes are available in 4 different color schemes. Take a look at this beautiful selection of running shoes below. The inner sole of this shoe has two layers of memory foam which provides cushioning effect and further acts as a shock absorber while running. It has the latest Rearfoot and Forefoot GEL Cushioning System which absorbs the shock from impact while running on smooth or uneven terrains. This system helps to avoid any foot injuries and assures that you can run comfortably. The gel cushioning technology works quite well in spreading the shock impact away from the balls of your feet. The outer sole of this shoe is made of carbon rubber which is durable, long lasting, and designed for maximum grip in wet weather, on slick roads, and on dry ground. The breathable mesh keeps the feet cool and blister free. Frequent runners will find these shoes take it easy on their heels, ankles, and knees. The GEL series by ASICS is popular among both men and women and for this reason; these running shoes are available for both genders. The GEL-Cumulus 16 for women can be found here. If you are an under pronator or a supinator with high arch feet and you run on a frequent basis, then you will definitely love the ASICS GEL-Cumulus 16 running shoes. It will be your all purpose and the go-to running shoe. The shoes feel snug as you slip your feet in them and they enhance your natural stride. The laces are set slightly off centered in order to give the shoe a tighter grip over your feet. A runner who values comfort, reliability, and durability of a running shoe will find the ASICS GEL-Nimbus 14 irresistible. It is not wonder that GEL Cumulus 16 is one of the best sellers. It is clear to me that ASICS cuts not corners when it comes to answering the needs of its customers and with GEL-Cumulus 16 they just have done so.